We are due to start work on drainage improvements at Abson Road in Wick on Monday 14 May 2018. This will involve a full closure of Abson Road from the junction with Rock Road to the junction with Feltham Road. The road will be subject to a full closure 24 hours a day from 9am on 14 May. A diversion will be in place, see the map for details. Access for residents and businesses on Abson Road will be maintained. 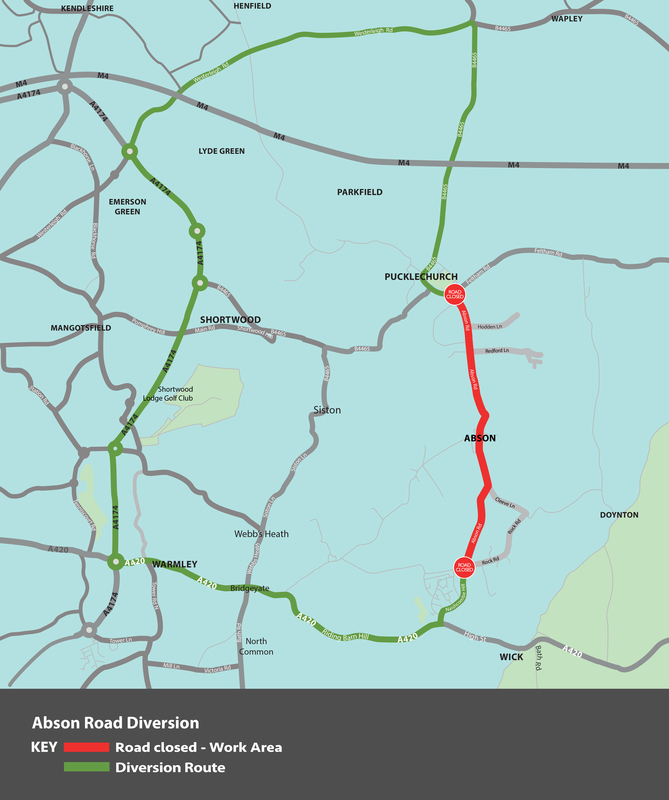 Abson Road was selected as one of nine sites across South Gloucestershire as part of a wider £3.35million Government funded scheme to improve drainage and flood protection systems. The 620 Stagecoach service will be affected by these works. We formally applied to the Traffic Commissioner to amend the route and timetable and this has now been accepted. The diversion will be via Siston Lane, please see the attached timetable for details. If you would like to be sent a copy of the revised timetable please email public.transport@southglos.gov.uk or call 01454 868004 to register your contact details with the Public Transport Team. We realise closing the road for a sustained period of time will have a significant impact on the local community and road users. We held two drop-in events in the community in May and will continue to liaise closely with those affected by the works.